Unlike competing flight simulators, "X-Plane" doesn't use a predetermined flight model. Instead, it uses a constantly updating fluid dynamics model to determine the lift, thrust and drag forces on an airplane. For users, this is a mixed bag: On the one hand, this makes it more complex and in many ways less forgiving. On the other, it means that pilots with real-world experience will be able to translate that more easily to the simulator, and it means that you can use the flight model to your advantage. Bring your joystick's throttle control to zero by moving it closer to you. Ensure that your joystick and rudder pedals, if you have any, are centered. Open the "controls" section of the options menu. Identify the axis currently set as "throttle" -- if it's not already labeled, move your throttle control back and forth and see which graph moves. Change the assignment from "throttle" to "collective." Open the "aircraft" menu and select "Bell 206 JetRanger." "X-Plane" will reload, and regardless of where you were before you will find yourself back on the ground, ready for takeoff. Hold down the "shift" and "F1" keys to increase throttle power. Helicopters don't use throttles in the same way that airplanes do, so once this step is completed you don't have to touch the throttle again. Slowly increase your joystick's throttle control, which now controls the helicopter's collective -- the angle at which the blades hit the air to generate lift. Stop when the helicopter is just starting to leave the ground. Move the joystick and rudder controls around in light, restrained movements. 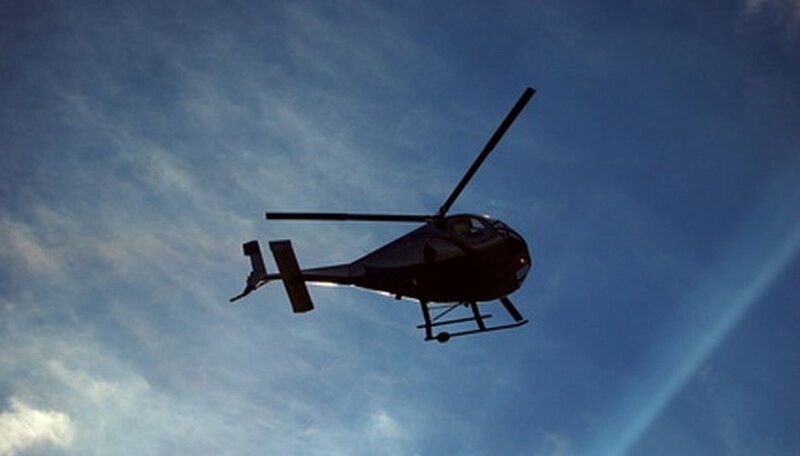 Helicopters are naturally more unstable than other aircraft, and extreme movements can make you lose control quickly. Increase the collective power all the way to take the helicopter into full flight. To move forward, the nose of the helicopter will have to be pointed downward -- it helps to think of the vehicle as suspended beneath its main rotor, clawing its way through the air in the direction that the rotor axis is pointing. Press the "A" key to switch to an external view, and then press the "/" key twice. This will show you the flight model that "X-Plane" is calculating for your helicopter. Note how the green and red lines change as you move your controls or increase or decrease power. Reduce the collective power very slowly. Rather than the position of the helicopter or the readings of the instruments, watch the flight model to keep your movements smooth and precise. Monitor your descent rate carefully, and if you find yourself falling too quickly, increase collective power again. Choose a point on the ground -- like a tree, a discoloration in the scenery, or a house -- and move the helicopter in relation to it. If necessary, move the external view around using the arrow keys. Tilt the joystick forward to maintain a slight forward movement as you approach your target position. "X-Plane" models "vortex ring state," a condition in which a descending helicopter's main rotor interferes with its own airstream, causing a catastrophic loss of lift. Avoid descending straight down. Cut power to the collective immediately as soon as you touch down. How Does a Paper Airplane Fly?